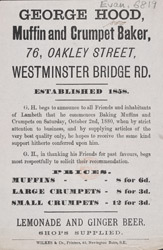 Bakers shops in the 19th Century were not particularly hygienic places. They were usually located in basements below the bakers shop and drainage and sewerage pipes ran through the workshops. There was very little fresh air and stone floors were uneven and infrequently washed. The poor ventilation combined with the heat from the ovens meant that when bakers kneaded the dough a lot of sweat ran into the mixture. To make the bread whiter alum was added and this made the bread taste very bitter. Inspite of these problems, home cooking of bread declined and visiting the bakers shop became an essential ritual for the Victorians.